Nap Away Your Stress With The Amazing Amethyst Infrared Bio-Mat! What are the benefits of Negative Ions & Infrared Rays? Nap away on the Amethyst Biomat while receiving negative ion, far-infrared and delta entertainment therapy. Soothe & calm the nerves, improve immune function, assist detoxification and reduce stress, fatigue and pain. You wear comfortable clothing with this treatment. 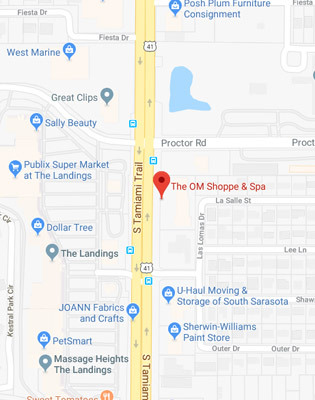 All Spa treatments at The OM Shoppe & Spa include the Bio-Mat, or you can just enjoy a truly restorative nap on its own – The Bio-Mat is a treatment in itself! I really look forward to visiting the OM Shoppe in general, as it is such a place of peace and serenity. Having been recently diagnosed with Parkinson’s Disease, I have found a noticeable improvement in my symptoms after doing Biomat treatments there as well. Not only do the tremors subside within about 10 minutes or so, I always come away feeling extremely calm and very refreshed. I have found that the benefits last for a few days, and am extremely grateful to have found this right here in Sarasota . I would heartily recommend it to anyone for its de-stressing and rejuvenating effects. *None of the statements here are meant to treat, cure or diagnose. Choose from multiple settings, or the Power Only allows you to enjoy the negative ions only without heat. Green Setting: safest for Sensitive & Extended Use at 95 to 104 Degrees. For overall general health care, immune stimulation, boost energy, relieve headaches, improve digestion, recover from jet lag and improve regenerative sleep patterns. Low Gold Settings: provides a Dynamic Subtle Warmth at 113 to 122 degrees up to 2 hours. Advised for athletes, flexibility training, cardiovascular support, blood pressure regulation and sugar regulation. High Gold Setting: delivers a deeply penetrating warmth of 131 to 140 degrees, recommend up to 90 minutes. Used to relieve joint pain, reduce stress and trauma, deep relaxation and elevate mood. Red Settings: the maximum setting for deep heat and maximum benefit of 149 to 158 degrees. Recommended for 30 minute to 60 minute sessions. This range promotes detoxification, weight loss, skin tone, stimulates metabolism, improves blood circulation. This range is comparable to an infrared sauna. The core of the Richway BioMat technology is a combination of far infrared rays, negative ions and the conductive properties of amethyst channels. These three powerful health stimulators are combined in a single, easy-to-use product with remarkable benefits. It’s a safe and natural way to experience relief and improved wellness. This is a FDA approved medical device for the temporary relief from minor spasms, minor sprains , minor strains, minor joint pain associated with arthritis, minor muscle pain and more. This technology is based on Nobel prize-winning scientific research pioneered by NASA and developed using pure, natural materials. The BioMat is Included in all OM Shoppe & Spa treatments and is also available as a stand alone treatment. Book your rejuvenating nap time today. The OM Shoppe makes no claims that the bio-mat or any of its treatments treats, cures, diagnosis or improves medical conditions.